The 8-story WTC 6 lay between the North Tower and WTC 7. WTC 6 was evidently damaged before either tower fell and had an unexplained crater that went to the lowest basement level. 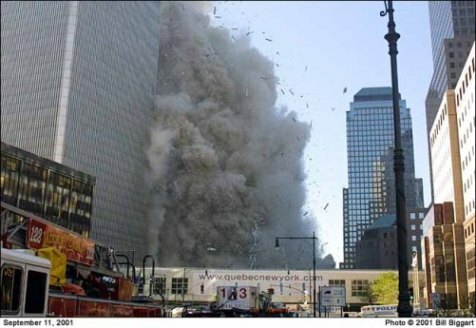 The basement of the building appears to have experienced an explosion at the exact moment the South Tower was hit by a plane. In this photo the rubble of the North Tower is on the left and the remains of WTC 7 are on the lower right. The destruction of WTC 6 is one of the many unexplained questions of 9-11. This 8-story building suffered a huge crater in its center which went all the way down to sub-basement levels. 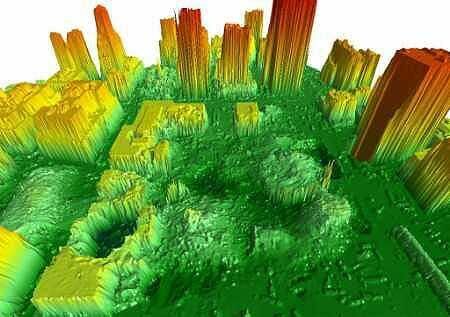 What caused the huge crater in the middle of WTC 6? This infrared image shows the large and deep crater in the center of WTC 6 (lower left). There is no explanation for the deep crater that goes into the sublevels of the 8-story building. The mystery plume seen rising over WTC 6 evidently occured as the second tower began collapsing. 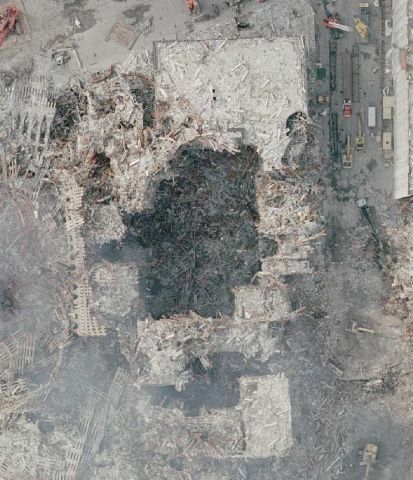 It appears to be a sandy-colored plume rising from the area of the crater seen in WTC 6. The plume appears to be rising from the exact area of the huge crater. The same explosion probably caused the secondary light plume seen in the second photo by the late Bill Biggart, seen below. A photo shows the damaged WTC 6 on the left of the North Tower. WTC 6 lay between the North Tower and WTC 7, Larry Silverstein’s 47-story building that mysteriously collapsed in a controlled demolition at 5:25 p.m. on 9-11. The fact that the WTC 6 building was severely damaged before the first tower collapsed can be seen in photos taken by Bill Biggart, a photographer who was killed on 9-11 when the North Tower collapsed. His digital photos were salvaged from his camera. The website StagedTerror.com has an excellent analysis of his photos. This photograph by Bill Biggart, who died when the North Tower collapsed, shows what appears to be a damaged and burnt WTC 6 on the left, in front of the North Tower. This photo was taken as the South Tower was demolished with super-thermite, which caused the super-pulverization of the concrete. Whatever caused the scorched damage to WTC 6 clearly happened before the first tower collapsed. 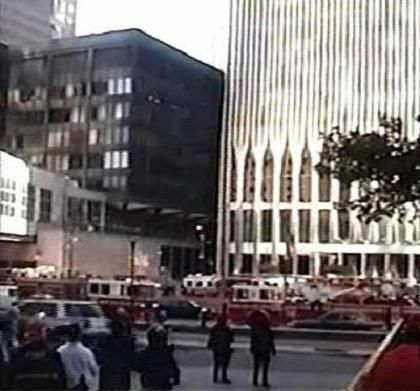 This photo shows the collapse of WTC 2 with a mystery plume of light smoke rising from the street beside WTC 6. 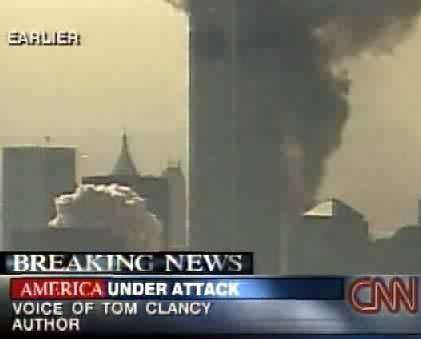 This secondary plume of sandy-colored dust is similar to the larger plume seen in the CNN footage rising above WTC 6. Both of these plumes are light and sandy in color and appear to be of another composition than the concrete dust clouds of the pulverized tower. 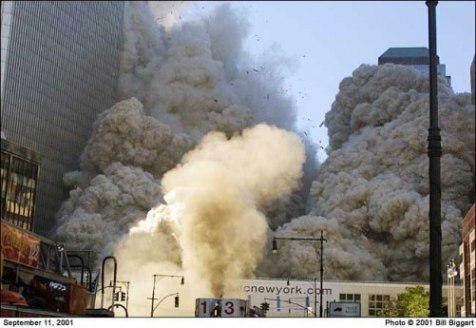 This plume is clearly rising from below the street and is not part of the pyroclastic cloud coming from the demolished WTC 2. It is rising from below the street and obstructing the Quebec-New York.com sign seen behind it on the walkway, while the pyroclastic cloud has not yet reached the walkway. These images suggest that a powerful explosion may have occurred below WTC 6 at the exact time WTC 2 collapsed.